Love it or hate it, Valentine's Day is coming. If you're pulling your hair out trying to think up a Valentine's Day date, on top of your already hectic life, then ask your books for help. There is no shortage of cute, elegant, cheesy, and fun date ideas in romance novels. And ladies, if your significant other is in charge of Valentine's Day this year, don't be afraid to "subtly" share this with them. If you already have your Valentine's Day planned out this year, that's okay. These date ideas work great year-round too! Below are some date ideas inspired by romantic novel elements, straight out of the books themselves, or that just keep in mind your love of books. Is there any moment more magical than when two people, destined to be in love, meet? Maybe you want to recreate the moment you first laid eyes on your partner. Or, maybe you'd rather take a page out of one of your books and recreate the first time your favorite characters gazed, bumped, or stumbled into each other. Either way, sparks will fly. If you haven't already enjoyed that milestone moment of kissing on top of a Ferris wheel, then maybe this is your chance. There are tons of different options for incorporating that Ferris wheel Kiss into your Valentine's Day. Search your town for the closest Ferris wheel near you, perhaps in a mall, fair, or park. Once you've found your perfect Ferris wheel, plan a date that leads up to that Ferris wheel kiss. (Bonus points if you can convince the operator to let you ride multiple turns in a row.) Or, plan a day in your local amusement park and, when the time is right, grab some cotton candy to enjoy and head on over to the Ferris wheel. You know what to do next. At the beginning of every romance, there is a thirst to discover one another and uncover all those secrets and quirks that make that person so remarkable and worthy of turning your life around. Sure, you've probably been together for a while now and you have a pretty good idea of who your partner is. But when was the last time you really sat down with them and had a deep conversation about each other? A lot can change over the years. Take this chance to do something with your lover to help you remember what it is about them that makes them so special. Maybe it's over dinner or coffee, staring deeply into each other's eyes as you ask question after question about their day, family, friends, and hobbies. Or maybe it's going with your partner to see their family and remembering the first time you met your future relatives and saw how much they adored your partner. Maybe it's learning more about what your other half is into and experiencing it yourself. Why is it that so many romances involve one of the main characters realizing that their flashy life of money and wealth isn't as good as their charity-doing lover's small-town, poor life? Maybe it's because everyone, at one point or another, loses track of what really matters: being surrounded by people who love you. So, for this Valentine's Day, why not take a step back and volunteer at a local food bank, or animal shelter, or any local charity. This can help you and your partner remember how lucky you are to have each other, and the life you've built together. Maybe you've already built regular date nights into your relationship, and Valentine's Day doesn't seem like something to worry too much about. But, if you're anything like me, your date nights have fallen into the familiar pattern of dinner, movie, cuddle time (wink, wink). Take this Valentine's Day to change things up a little bit. Pick a favorite date from a romance novel and recreate it with your partner. Or, maybe some of these date ideas from popular romance novels will spark your interest. In this popular Nicholas Sparks novel, Elizabeth and Thibault go to Shagging for Crabs, a locals-only restaurant that serves crab prepared just one way—to be eaten with your hands with pitchers of melted butter and beer. And of course, they finish off the meal by dancing the Carolina shag in front of a live band at the restaurant. This date combo packet has it all: that local, intimate feel; the messy, memory making meal; live music; and a cheesy post-date activity that's sure to please. You probably don't have a Shagging for Crabs establishment in your home town, but you're sure to have other local exclusives, or if you're set on crabs, seafood restaurants abound. Finish off the night with a cheesy, post-date activity like mini-golfing, ice-skating, bowling, or, of course, dancing! In this popular novel, Sophia meets Luke as he’s getting back into the bull-riding circuit. She spends time with him at his ranch and watches him train on a mechanical bull. And of course, no training would be complete without some sore muscles. "Sunday nights often found him in his bedroom, surrounded by candles as Sophia kneaded his muscles, trying to work out his aches and pains." In this timeless romance, Noah takes Allie out in a canoe to a secluded lake that’s filled with "thousands" of birds. They stay in their hideaway until a thunderstorm forces them back home. Now, if you know of your own secluded lake filled with thousands of birds, then you know exactly where to go to for this date. However, if you're not that lucky, then a local pond, lake, or beach should do the trick. Since I firmly believe that every Valentine's Day date should include food, enjoy a picnic on the banks first, before the rowing. Look for a place to rent a rowboat, kayak, or paddle boat and take a few turns around the lake. And guys, for the sake of romance, please take one for the team and row the boat for a little while to give her a chance to admire your strong, flexing muscles. Valentine's date ideas don't just have to be for couples. In the novel, Gabby is forced into hanging out with her neighbor, Travis, and his conveniently six coupled-up friends, and they spend the day parasailing, barbecuing on a cove, and having the most perfect beach day ever. 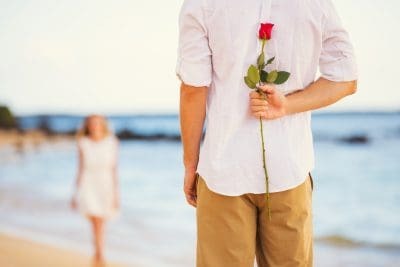 Now, getting stuck at the beach all day with all your couple friends and that one loser guy they always invite for you might seem like your nightmare, but if you take charge of the situation, you might be able to create a little love story of your own. Get a bunch of your single friends together and pledge to ask someone out together this Valentine's Day. If you don't live in a beach town like most romance characters seem to, then a park or lake should do the trick. Plan a bunch of group activities that the characters from The Choice would be envious of, and in the end, you'll have an active environment where you'll get to admire/examine your potential lover in a variety of different situations and around all your friends. You know, so that you can discuss and analyze once the date is over. The best part of watching a movie based on a book you've read is getting to judge it harshly. Sure, many movie adaptations of books aren't that bad (and some are horrible), but no matter how good the movie is, the book will always be better. No question. So rent a movie based off a book you've both read, and have fun tearing it to pieces. If you're feeling particularly daring, turn it into a whole marathon. The best part about this date is that you can do it at home in your pj's if you're a couple who's tired of going out. For this date, you and your partner will venture to one of your favorite settings: a book store! While there, you and your partner will go your separate ways on a quest to pick out books you think the other person would like. Once you've both made your selections, meet back up. (Tip: Book store/cafe combos work excellent for this as you can grab a bite to eat while you go over the books.) Show your partner the books you think they'd like and explain to them why you chose that book. You will probably either be amused or impressed by what your partner picked out. Once you've gone through them all, pick the book you like best from your partner's selections, and purchase it. Over the next couple days, read the book you got, and fill your partner in on your final verdict. The person who picked the best book gets to pick where you next go to dinner, and the person who picked the worst book gets to pay. Are there any literary sites in your area that you and you lover can visit together? Odds are there are a couple, whether it's a museum, an important landmark or home from an author's life, or the real-life land that inspired a scene from a book. Find a few of these landmarks near you, and spend the day getting a unique take on literature. This list of 50 Places Every Literary Fan Should Visit might be able to help get you started with your planning. Perhaps one of the nicest things you can do for your book-loving loved one is to simply give them distraction-free time to read. It's no secret that as we get older and the responsibilities of life become harder to manage, many of us can't find time to read the books we hold so dearly. So, this Valentine's Day, set up a cozy corner for your loved one, complete with a fuzzy blanket, their favorite drink, and a few munchies to enjoy, and give them the gift of reading. Reassure them that this is their time to read, and that you'll take care of the rest of the responsibilities for the day so that they don't have to worry about anything. I'm sure your book-loving partner will thank you later. We hope you've enjoyed these book-inspired Valentine's date ideas. What special plans do you have for Valentine's Day this year? We'd love to hear! Share with us in the comments below. Non-commercial users, feel free to print this out for personal use or give to friends, share online, or make a meme of, as long as you attribute and link back to us. Commercial users, you may share a link to this post or quote a short excerpt from it with attribution and a link to this site, but you may not use this post in its entirety. Thank you for caring about copyright.